Ok, hands up, who has ever thrown a banana skin in a bush after a picnic? Maybe chucked an apple core out of the window of your car whilst travelling down a quiet country road? I expect a few people have done this in the past. And why not? It’s biodegradable, right? Whilst this may horrify those who see it as littering, food waste is often considered ‘harmless’ to the environment, as it rots down and is eaten by detritivores or passing wildlife. At the worst it is considered unsightly or foul smelling for a short time. THE TRUE DAMAGE OF YOUR FOOD WASTE however, when thrown in to landfill sites, this couldn’t be further from the truth. In landfill, organic waste is buried and deprived of oxygen. This causes the production of methane as it decomposes, a powerful Greenhouse Gas (GHG) that is about 25 times more harmful to the environment than Carbon Dioxide (CO2). Studies by the UN’s Food and Agriculture Organisation have found that 1.3 billion tonnes of global food waste is disposed of into landfill each year. This results in an incredible 3.3 billion tonnes of CO2 equivalent being released every year. In order to put this massive figure into context, this finding places food waste in landfill sites as the third highest global contributor to GHG emissions, behind the USA and China. That’s an awfully high price to pay for disposing of your ‘biodegradable’ food waste. So what effect do these GHG’s have, and why do we care? Greenhouse gases such as carbon dioxide, methane, water vapour, nitrous oxide, CFC’s and ozone, are naturally occurring gases in our atmosphere and, when balanced, allow for the warmth of the sun to be trapped to a point that maximises our ability to live on Earth. The problems began in the beginning of the Industrial Revolution in the 1700’s, where fossil fuels were used to power the rise of industrial practises. Over the centuries this has released vast quantities of CO2 into the atmosphere and, coupled with the subsequent deforestation and changes in land use, has caused the Enhanced Greenhouse Effect, causing increased surface and ocean temperatures, the melting of the ice caps, changing precipitation and increased risk of extreme weather events, to name a few. The uncertainty of the future effects of climate change and the feedback effects linked to the affected natural cycles is a grave cause for concern and has prompted an attempt at international action. The first treaty agreeing to act on climate change and GHG emissions on a global scale was signed in Rio de Janeiro in 1992 at the UN’s Earth Summit. Now, over 20 years on, the next meeting is due to be held in Paris at the end of November and debate is still going on about how best to tackle the problem. The panel has many obstacles to overcome before we see a world acting together to fight climate change and keep global warming down to the desired 2°C increase. For example, different state viewpoints and agenda’s often cause conflict and the short term nature of political parties mean that often only issues that are going to win politicians the next election are taken seriously. Climate change will affect us for generations and generations to come and, if not taken seriously now, will be unstoppable and unpredictable. However we can do something about it. Instead of relying on governments and heads of states, with their many well-meaning but slow and bureaucratic processes, let’s cut our food waste and stop throwing it in landfills! I’m certainly not suggesting that we throw our banana peels on to the street, but we could consider composters to dispose of our waste and fertilise our gardens at the same time! Sadly we are unable to recycle our food waste through our standard bin collections in West Sussex at the moment, but West Sussex County Council do offer discounts on composting bins to help you get started and take matters into your own hands! 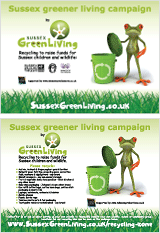 More information can be found at: http://www.wsussex.getcomposting.com/. Anaerobic Digestion (AD) Plants are also a positive step forward in better disposing of our food waste and helping to improve our energy security. The Agrivert AD plant at Trumps Farm near Chertsey in Surrey is one such example of how this energy source can be supplied on a large scale. As well as supplying fertiliser to local farms, it produces enough energy to power itself and a further 4,600 houses, that’s the equivalent of 5 times more homes than found in the new Wickhurst Green development in Broadbridge Heath! It seems to make complete sense to use unwanted food waste and turn it in to energy to power our communities. To find out more about this AD plan please visit their website on http://www.agrivert.co.uk/agrivert-and-grundon-open-11m-surrey-ad-plant . However, the best way to reduce the amount of food waste going into landfills is to reduce the amount of food we waste! It sounds simple but, with our busy lives and supermarkets tempting us with more and more deals, we need to fight to keep food waste from our bins. And who said the fight couldn’t be a tasty one? There are cookbooks out there to help us make the most of our leftovers and TV chef Hugh Fernley-Whittingstall is the latest cook to jump on the band wagon with his new book ‘Love Your Leftovers’ hitting the shops in time for Christmas. If you cook with leftovers, not only are your reducing the effects of climate change for your children and your children’s children, but you are saving money and getting creative at the same time! With the average family wasting £600 a year on food, these recipes could really come in handy! To get a taste of how good ‘leftover’ food can be, why not come along to Brighton’s ‘Feeding the 5000’ event on 29th October! This free event could prove a real eye opener! Check out their Facebook page to find out more information. Alternatively there is an amazing initiative called The Rubbish Diet, through which people are encouraged to make small changes to their habits to reduce the amount of food waste that they throw away! There is a community where you can swap ideas and get support from like-minded people! Their website, http://www.therubbishdiet.org.uk/, is certainly worth a visit! Sussex Green Living would love to hear ingenious ways that you have been using leftovers and reducing your food waste! Tweet and follow us at twitter.com/Sussexgreen #weloveourleftovers or comment on our Facebook page at facebook.com/SussexGreenLiving! We can’t wait to hear your stories and share your culinary successes!